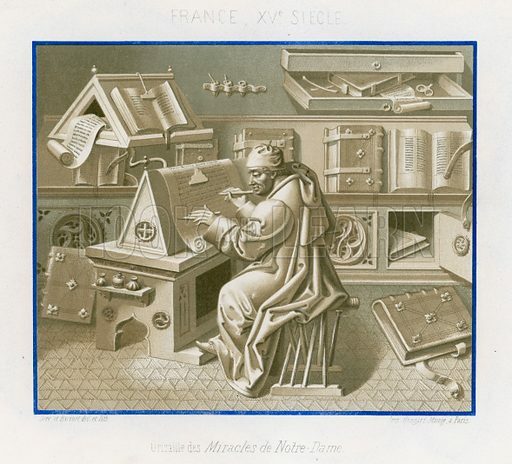 Image in grisaille from The Miracles of Our Lady showing Jean Mielot in the scriptorium, 15th-century France. Drawn by and lithography by Ferdinand Sere and Aug Racinet. Illustration for Les Arts Somptuaires, Histoire du Costume et de l'Amueublement (Hangard-Mauge, 1858). Chromolithograph of exceptional quality. Available worldwide for immediate download up to 4,707 x 4,269 pixels.